Nancy Brinker is “seeing red” over the recent New York Times article detailing how some breast cancer patients are tired of the “pinkification” of disease (see her letter here, see what she is angry about here). Her letter was strange to me, and would be laughable except 1) as the head of Komen her voice will be heard (although she claims she is NOT responding as a Komen representative) and 2) so many people will agree with her, will not look at her defensive whining with a critical and analytical eye. I find soooooo many problems with her letter—and I’m not even as staunchly anti-Komen as so many other bloggers!! But here are my gripes. Well, Nancy, you say the Pink Ribbon now symbolizes breast cancer. You’re not wrong there. You go on to say breast cancer is very personal for you. It is personal for me too, since, you know, I actually was diagnosed with it myself at age 38. It continues to be personal for me as I know I could have a recurrence at any time. It is personal for thousands of other patients currently living with metastatic breast cancer. What makes you think you have a monopoly on personal feelings about breast cancer? Your claim of it being personal just illustrates your tone deafness, your inability to realize the cancer demographic is made up of lots of individuals with VERY different perspectives. We are not homogenous, and no one’s personal relationship with breast cancer is more important than another’s, not even yours. You say you made a promise to your sister to work to find a cure, to raise awareness for the need for testing, treatment, research, cures, and to raise money for research. Let’s unpack these promises, shall we? Your first promise, to find a cure, has not been fulfilled. The second promise, to raise awareness, you’ve been successful—congratulations. But that awareness has not translated to meaningful results—see broken promise #1. Instead, you continue to work on “awareness” as if no one is aware, as if you only wish to do what you know, rather than face new challenges. This has made you, your organization, and other pink organizations, stagnant institutions. The stagnation is killing people. Rather than evolving, than checking off the “raised awareness” task from your list, you continue to only do what has been done for 20+ years. 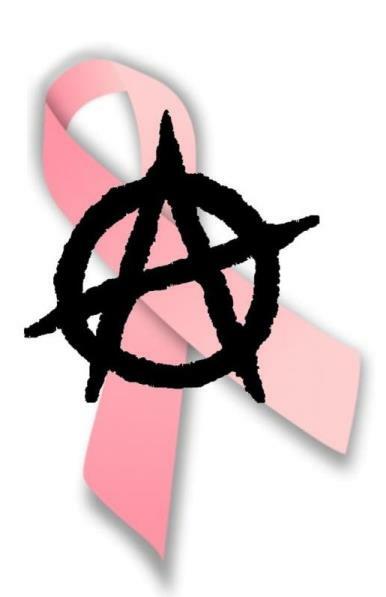 That’s why my avatar is the anarchy symbol over “A” (not YOUR, copyrighted) pink ribbon. We need a little anarchy—or at least an overhaul. And oh my goodness, the third promise you state in your letter. You’ve raised billions, but has it gone to research? No. More money goes to education, screening (and screening is ALWAYS controversial), and of course to fundraising (it takes money to raise money) than to research (see here, page 7). You list the (non)-achievements of the Pink Ribbon as allowing Komen to stage races with over a million racers, establishing partnerships in numerous countries, and engaging thousands of volunteers. I am NOT impressed by any of that. Big deal, people ran in races—there are plenty of marathons out there. The partnerships—good grief, look no further than the recent fracking/drill bit fiasco for the worth of those partnerships (but if anyone wants to look further, well, there’s the KFC chicken, the Dietz & Watson—because cured meats are so good for you, and all the shopping, shopping, shopping). And you provided opportunities for volunteers to do what they do: volunteer. Hey volunteers are gold. But their work needs to be meaningful. It seems all the work has achieved is perpetuating your stagnant institution. You close with “Pink Ribbons matter”. I hope that was NOT a reference to the “#(whatever)livesmatter” campaigns. Komen has already proven time and again their inability to come up with original ideas. See your own admission about “borrowing” the red ribbon idea from the AIDS movement. How about the elephant stolen from METAvivor last year in that stupid Kohl’s campaign? Originality is part of evolution. Yes, lives matter, mine too. Most of the non-achievements did not benefit me. Early detection and screening? Nope—I tried that, but the mammogram (or rather the radiologist) did not find my cancer. Sure, the awareness raised by pink ribbons funded research that created drugs like Herceptin, which allows me to still be here writing this critique. However, unless I’m mistaken, the money raised for Herceptin research came from Avon—but never mind, let the ribbon’s ubiquity claim that prize. But all the races, pink ribbons, and volunteers did not prevent me from getting cancer in the first place. Ribbons won’t prevent my likelihood of recurrence and metastasis. Right now, Pink Ribbons don’t matter. Even non-breast cancer patients are tired of them, have become immune, sometimes blind to them. (That was one of the points of the piece to which you object–how did you miss that?) Pink Ribbons are stagnant and Pinktober has become an institution, celebrated right along with Halloween. They symbolize breast cancer, but the threats to me and others remain. The death rate has not really changed. (Sure, there are more survivors, but the controversy surrounding the screening debates can tell anyone that it’s easy to create more survivors, if you create more patients that maybe never should’ve been called patients. But I digress). That symbol is no solution for my breast cancer, for my friends’ cancers. Here is my challenge to you Brinker—realize how ridiculous Komen has become and do something about it. I think Komen is incapable of evolution. Prove me wrong. Many orgs seem to be out of touch–subject of an upcoming post–I just got distracted today-oy! Bravo bravo bravo. All those things said I have thought but didn’t know how to put down on paper. I am living with metsbc. I was first diagnosed at the age of 40 and it was NOT detected by a mammo. It was detected by me and only after I insisted that something was wrong was there a biopsy done. 2 yrs ago my cancer returned. I have come to loath the pink thing. I’ve come to loath October and it’s my birthday month. It’s my birthday month too–and I LOVE Halloween, but it’s kind of hard to enjoy it with the pink everywhere, grr. I love it! Prove me wrong! It is exactly the right message to send. I too challenge them to find new messaging and refocuses on cure mission. Too much scientific evidence does not support the “early screening saves lives message”. Awareness supported that storyline. Research supports the find a cure storyline esp research into the aspect that is killing us … Metastatic breast cancer. How come we don’t know how metastases works, how come we don’t know which cancers are more or less likely to metastasize, how come we don’t know how to stop metastases once it has started. If they are looking for questions, those are a few to start with! I’ve been living with stage IV bc for 12 years now, not sure how many I’ve got left….the tail of the survival curve does go that far…. Not reassuring! Thanks! As I’ve said here and on other social media–I don’t really think Komen is capable. But then, they are not the only ones stuck in a rut–our whole culture is stuck in this rut when it comes to breast cancer. It’s only been 5 years since I got cancer, 3 years since I started this blog, and I’m already heartily sick of the lack of progress, the same issues popping up over and over. Move forward! Komen especially should stop resting on their laurels. Grrrr. I am hoping you are not on that tail end of the curve, that you have MANY more years with us. GREAT response – I am embarrassed and saddened for her since she can’t seem to grasp how tragic her empty promise to her dead sister is…how is she not hearing us? Perhaps she bought sound proof windows with her 6 figure salaries. YES! I asked on my FB page–how on earth is this woman a high paid head of such a huge org, how did she write this letter to a major media outlet, a letter that was so terrible? Shudder! As always, job well done. Unfortunately, you’re preaching to the choir as Nancy will never acknowledge the shortcomings of the Komen group. She can only shout … “Look at the good we’ve done!” Kind of like the Cubs riding on the glory years of 1907 and 1908 … the last time they won a World Series. It just isn’t good enough anymore. Oh I hear you about the preaching to the choir. I looked at the comments on her FB page, and it see how pointless to try to change anyone’s thinking. I was struck by how stuck in the past everyone was–so proud of what has been “achieved” (not much) and afraid to ask for more! Maybe that is how anyone can make an impact–a challenge!! Glad to see someone agrees! Pinked Washed? is trying to bring to light how corrupt funding allocation is in the nonprofit world while also curating a list of other organizations to support as well as other ways to help support breast cancer research and those currently fighting the disease: http://bit.ly/1WK2exU. Since you have such a strong opinion about this, like us, I thought you might have some organizations you’d like to add to our list. Thanks and have a great day! One thing that continues to bother me, too, is how so often we are all lumped together and expected to feel the same way about pink ribbons, or whatever it might be regarding breast cancer. I thought Nancy Brinker’s letter was very weak. And yes, like she has a monopoly on “personal.” Give me a break. As Kathi said, she seems so out of touch. A person in her position should be welcoming discussions, debate, and yes, questions about pink ribbons and everything related to breast cancer. It seems it’s her way or no way. Your response is just perfect. Thank you. Thanks Nancy! Like that saying: some people would rather be destroyed by praise than helped by criticism. That fits perfectly in this case. And watching her reactions on social media to her critics and to her flatterers, well, it just reinforced for me how many miles there are to go. Sigh. Reblogged this on Sherri Fillipo. Though I have had a recent diagnosis of breast cancer, I avoid buying anything which has a pink ribbon it, for many of the reasons above. When the sheer amount of money that could go into breast cancer research, and does not, and when the data could be helpful for other cancers is not available, I can only conclude that this is not about saving lives, but about saving ‘livings’ for some very entitled people. I am glad that we can at least say the term, “breast cancer” outloud, but that happened many years ago. I am more grateful to Angelina Jolie for the awareness to the the variations of cancer types that exist, in breast and other cancers. Poke around anywhere on this blog;I’m pretty clear in my disdain for all things pink–not just Komen. Of course I am grateful; I understand the big picture (see earlier post, Burden of Gratitude). But we are stuck in a rut! Thanks for reading and commenting! I had to share that post on my FaceBook page!! By all means–that is what I put this stuff out there for! Wow, the power of these words, you all`s voices. I have celebrated the life of an Aunt who died in 1981 Breast Cancer, but it was the radiation that took her from us. I also continue in celebration and prayer for my surviving relatives , friends (who have shared their diagnosis with me), also the men , and however it the women like you all! Courageous in this place called life. The Lymp nob biopsy report given to me by doctors in the early 1990`s was benign. And, I thank the Lord-God for life, living, and healing. Beyond these things, Our daughters I really would appreciate the color pink not to be used as a symbol for Breast Cancer (anything) cause all of our world`s new born nurseries. These are beautiful expression of life given to be nurtured and to live therefore, when it’s colors of the baby boy blues with the baby girl pinks filling up the viewing window for the new parents, their family members, and friend sharing in tears of joy , hope, and love, unified thoughts of preservation offers heal towards the things we hope for through Faith in the same a shared offering of goodwill to all of mankind. So, yes rethinking ways to separate and promote life as living institution(s) culturally respective is one of the greatest gift nature has given us “…Faith, Hope, and Love, but the greatest of these (3) three is LOVE. Funny how pink got all tangled up with cancer when it used to be a baby color, isn’t it? Although I once read this thing that explained historically, red/pink was for boys, and blue for girls–go figure! Pink was used for breast cancer quite deliberately of course, Breast Cancer Action has a great page on their website about how all of this nonsense came about. I’m not a fan of any color ribbons-I think symbols leave out too much of any story (diseases not just cancer, issues like hunger, violence, etc), but sadly in our busy world nowadays, people like symbols. I realize I’m swinging against the tide there. Oh well. Next Next post: Thanks And Feel Free!